Gilhooley’s is a name that is as synonymous with the Galveston Bay Area as Joe’s Stone Crab is in Miami, Fla. These two landmark restaurants are polar opposites — one being known as a world famous seaside dive located in San Leon, Texas that serves the freshest succulent oysters from Galveston Bay while the other is Joe’s, one of the top first class restaurants in the universe, serving the best indescribably delicious Stone Crab Claws, slaw and tangy Key Lime Pie! No reason to head to Miami. Just take a short jaunt to San Leon to one of the Top 10 Dives in America. Gilhooley’s was recently rated No. 1 by GQ Magazine, as well as No. 1 in other periodicals such as Trip Advisor and many others around the world. Gilhooley’s is also popular with the Hollywood movie crowd. A recent filming of the Bay House, starring Leslie Ann Warren and Barry Corbin, was shot on site at the eatery this past November. Gilhooley’s serves, without a doubt, the freshest oysters, as well as a variety of seafood dishes such as large fried shrimp, fried oysters, oyster stew, mouth-watering gumbo, burgers, salads and much more. Its daily specials are not only freshly made but tasty and extremely affordable. Some of the daily specials include a whole stuffed flounder with two sides, beef vegetable soup (owner Misho’s favorite), delicious chicken fried steak, soups, salads, sandwiches and raw oysters. They also offer Boudin and Sausage, poor boys that are more than a mouthful and a full menu that is to die for! The atmosphere at this seafood restaurant and oyster bar is very rustic with 70s style furniture, pictures, a bar and a comfortable outdoor patio with bar area. This is reminiscent of the old Florida seafood houses like Capps near Boca Raton and Alabama Jacks, Jimmy Buffet’s former hangout in the Florida Keys. Come casual, enjoy the food, drinks and the uniqueness of Gilhooley’s. Most of the diners are locals who want to keep it a secret which it is not any longer! 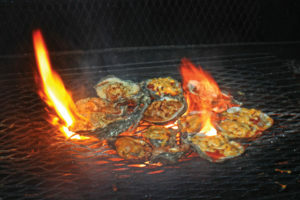 The legendary Oysters Gilhooley’s will melt in your mouth, and Oysters Picante is served hot and roasted to perfection. Try one of these delectable oyster platters with your favorite cold beverage. You will crave this euphoric experience each month! Finally, the service is very good, starting with the manager, Cassie, cheerful servers such as Sherry, and their knowledgeable bartenders. Gilhooley’s Restaurant and Oyster Bar has a national ranking of four out of five stars. It is now family friendly. Open 7 days a week, 11 a.m.- 10 p.m. It is located at 222 Ninth St., San Leon, Texas 77539. Telephone number is 281-339-3813.